To see the tree you're looking for, click on Common name links or scroll down on the left side of this page to find the tree. If you prefer to search by botanical name, click on Botanical name links. Click on Streets to see a list for your neighborhood. Does it surprise you to know that within the 3-4 square miles that Larkspur occupies there are at least 124 tree species growing in our neighborhoods? 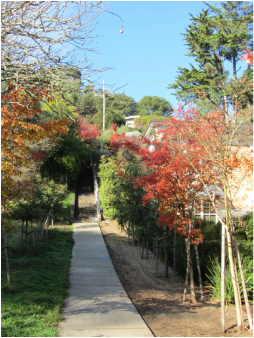 The purpose of this website is to identify many of the trees that can be found in Larkspur neighborhoods and to provide species information and historical notes. It is not intended to be a list of recommended trees for planting in and adjacent to streets and sidewalks. Contact Larkspur Public Works Department for lists of recommended species and planting guidelines. If a species shown here is on a recommended list, it will (eventually) be noted as such. Each page highlights a particular species and identifies one or more locations where it can be seen. All of the trees are in public spaces or easily visible from the street. It is never necessary to enter private property. Very young trees rarely resemble mature versions of themselves. This huge valley oak on Magnolia Ave. once looked like the young tree above. You will ensure satisfaction for yourselves, your neighbors and future generations if you first determine the potential size of the tree you are considering planting. Then, place it in a spot where there is plenty of room for it to grow and where its roots and branches won’t encroach into your neighbor’s property or conflict with overhead or underground utilities. 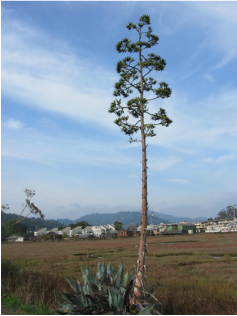 Agave flower stalk looming over the marsh just outside the rear fence of the Community Garden. 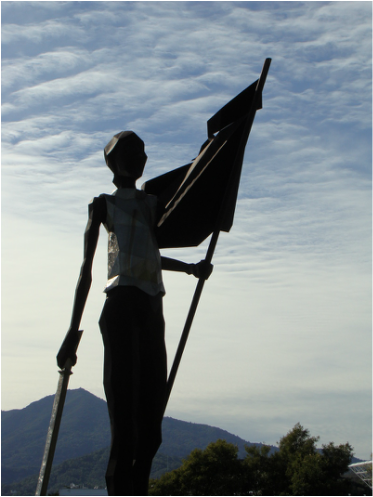 Fall 2011. Summer 2013...now there are two flower stalks. The one on the right has gone to seed and will eventually fall over. 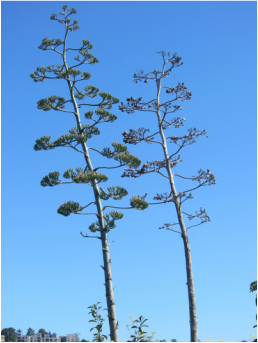 Some agave plants like this one send up a flower stalk as tall as a tree! Each rosette only develops a flower stalk once and after the fruit is formed the stalk and rosette both die. In the meantime, more rosettes are being formed along side the original and the pattern is repeated. Agaves are mainly native to Mexico, but also southern US and tropical South America. "The agave was meat, drink, clothing, and writing materials for the Aztec! Surely, never did Nature enclose in so compact a form so many of the elements of human comfort and civilization!"